How is it that two women on opposite sides of the globe can become friends, true friends through the words and images we share online? I’m still amazed when I trace the path of my friendship with Jodi Godfrey. She lives in Australia, myself in South Carolina. Still, we connected years ago over a shared love for Anna Maria Horner fabrics, when blogging was young. We Skyped to discuss homeschooling while carving out a creative business and followed each other on Flickr before Instagram existed. When Eleni suffered her tragic birth injury, Jodi’s Flowers for Eleni project interrupted my shock and despair with global rays of love and beauty in English paper pieced form. Now a quilt made by you all and joined by Jodi’s hands is one of my most treasured possessions. All this from words and photos and real life, shared on-screen. That is the magic of social media. That is its bright side. Today I’m honored to welcome Jodi’s business, Tales of Cloth, to Stitched in Color as a new sponsor. That’s right, the same friend I partnered with to bring you the free Kingfisher Quilt-Along pattern last summer is now partnering with me as a paid sponsor! How cool is that? Jodi and her husband Tim laser cut English Paper Pieces in the old hospital in Castlemaine Victoria, about an hour and a half north of Melbourne, Australia. They are the first and only manufacturer of English Paper Pieces that uses 100% post-consumer recycled paper and packaging. Plus, they only cut to order, to create absolute minimum waste. You may have run into Jodi on Instagram, where she shares an abundance of beauty @Tales of Cloth. Her Shop includes simple EPP pieces as well as unique EPP quilt patterns, kits and custom acrylic templates. She ships all over the world, and it’s quicker and more affordable than you’d expect. Each year she creates a unique EPP club, and that’s what I want to focus on today! 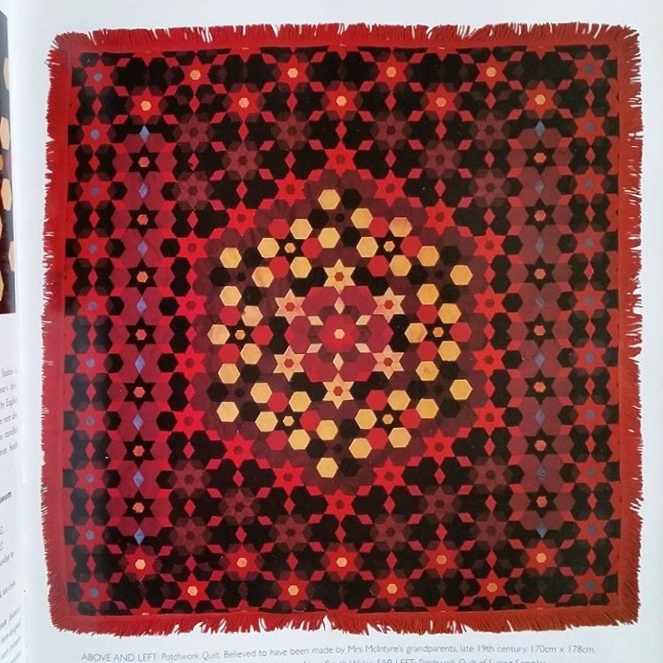 Over 100 years ago, Betty MacIntyre’s grandparents stitched a beautiful, striking quilt together with wool salvaged from British soldiers uniforms and newspaper for templates. When I first saw it in a book about 5 years ago, I knew immediately that I wanted to make it. And when I started making it, I knew I’d found my ‘home’. 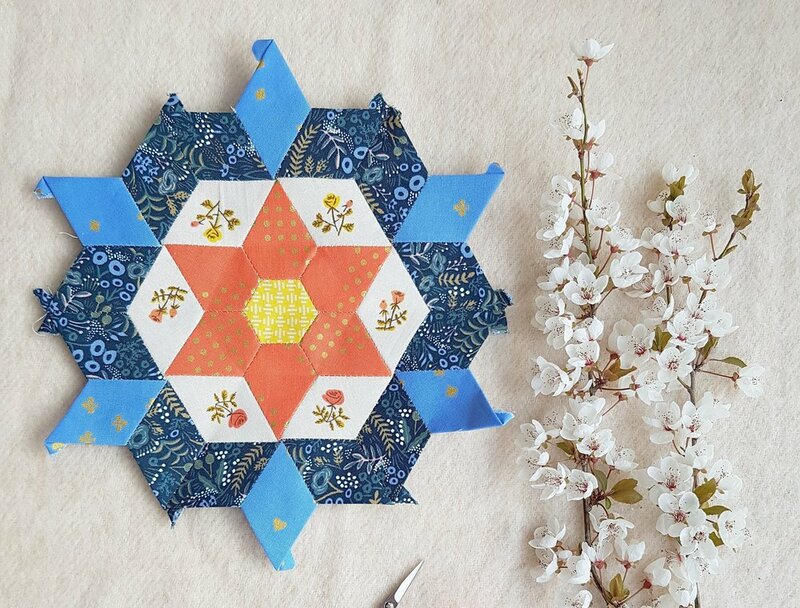 I wanted to share patterns and EPP kits for quilts like this to help other people stitch and enjoy the rich and beautiful heritage left by creative, ordinary people before us. 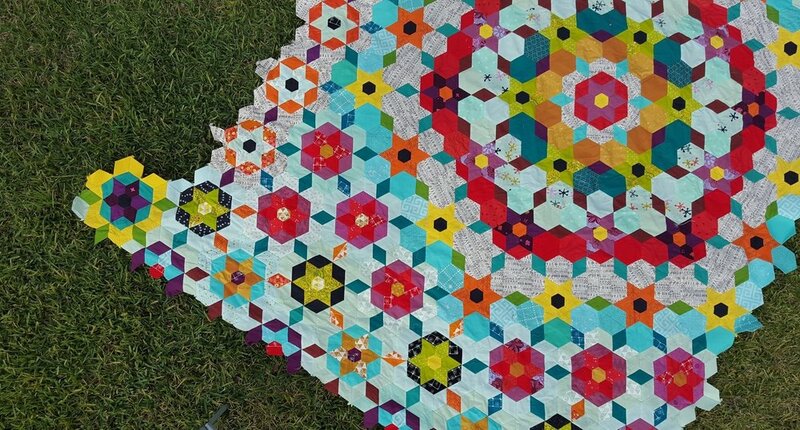 Join Jodi this year in making the beautiful Alexandria Quilt, a copy of an Australian quilt made in the late 1800's from British soldiers' uniforms. This is an intermediate level English paper pieced quilt. Jodi has divided into six sections or chapters to enjoy all year long. The Alexandria Quilt Club is available as a bi-monthly subscription or purchased the complete package. With the subscription model, the paper pieces for this club are mailed out every second month in six chapters, with enough pieces to make a section of the quilt over that 2 month period. You’ll also receive the quilt pattern via emailed PDF. Check out this blog post for more information including fabric requirements, a link to the colouring page, a centre block tutorial, and more photos. Also available, coordinating Acrylic templates for easy fussy cutting and scrap-using, as well as Fabric Scrap bags from Jodi’s studio, ideally sized for the Alexandria Quilt. Enrollment in the Alexander Quilt Club is open! You can join now through 8 am February 14th, eastern standard time (or midnight Australian Sydney time). To see a beautiful selection of Alexandria blocks in a great range of fabrics and styles, check out the #alexandriaquilt hashtag on Instagram.